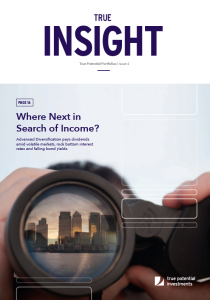 We’re pleased to announce that the fourth issue of our quarterly magazine True Insight, is now available, to download for free. In this edition, we look at some of the top stories from the past quarter and what the significance may be for investors. We also share our Investment Outlook and the views from our world-class fund manager partners, who’s forward-looking analysis is integral in the composition of our True Potential Portfolios. The first of our featured stories takes a look at emotions and how human nature can sometimes hamper the investment journey. Understanding yourself as an investor is key to understanding what you are willing to accept in terms of risk as well as your ability to hold your nerve during market volatility. Short-term fluctuations, which the long-term investor will know all too well, are often sensationalised and of little importance to someone playing the long-game, as our second feature story illustrates. Our third feature takes one of those sensationalised press stories, the historically low Bank of England interest rates, and discusses the alternatives available to investors as many high street banks followed suit with an interest rate cull. We also shine the spotlight on our Income Managers, Close Brothers, Columbia Threadneedle, Schroders and Goldman Sachs and how they believe their individual investment strategies can help generate a recurring income for clients. As we have reached the one-year anniversary of the True Potential Portfolios, we are delighted to be able to include a full complement of 12-months performance figures for all ten Portfolios within the magazine. The figures show our strategy of Advanced Diversification, aiming to maximise returns whilst minimising risk, by managing market volatility, working to great effect.